"...an excellent work of its kind... a model of the realistic approach." New York Times Book Review. 'You have talked so often of going to the dogs - and well, here are the dogs, and you have reached them.' 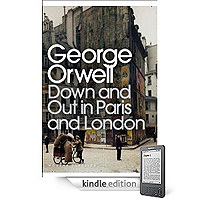 George Orwell's vivid memoir of his time among the desperately poor and destitute in London and Paris is a moving tour of the underworld of society. Here he painstakingly documents a world of unrelenting drudgery and squalor - sleeping in bug-infested hostels and doss houses, working as a dishwasher in the vile 'Hôtel X', living alongside tramps, surviving on scraps and cigarette butts - in an unforgettable account of what being down and out is really like. George Orwell felt awkward for being middle class, once he started to make a bit of money as an author this added to his awkwardness and he spent a lot of time in dank and impoverished surroundings. This book is largely autobiographic, it tells of his time spent with the homeless. Orwell would pretend to be a tramp, not just pretend - he would live as a tramp from time to time. It was his time as a tramp that feed the ideas in this book. Orwell writes about the camaraderie in the tramp community with warmth, you can feel his fondness for the people he is writing about. The tramp experience covers only the second part of the book. The first part describes the life of Parisian hotel/restaurant kitchen workers. It isn't glamorous. It is a life devoid of love, warmth, and happiness. Boris is the star of the "Paris" part of this book. This is not only one of Orwell's finest pieces of work, it is a book that changes how you feel about life. When I read this book I was struggling financially - but this book put things in perspective, and I still imagine scenes in this book when times are hard. The contrast between the "Paris" and "London" aspects of the book couldn't be more different, even though both are concerning that corner of society who seem to have nothing. Read this book on the bus/train on the commute to work and you'll get lost in the dark visuals it inspires. The book had many place names and people's names removed for fear of being libellous, at first this seems clumsy but you get used to it.